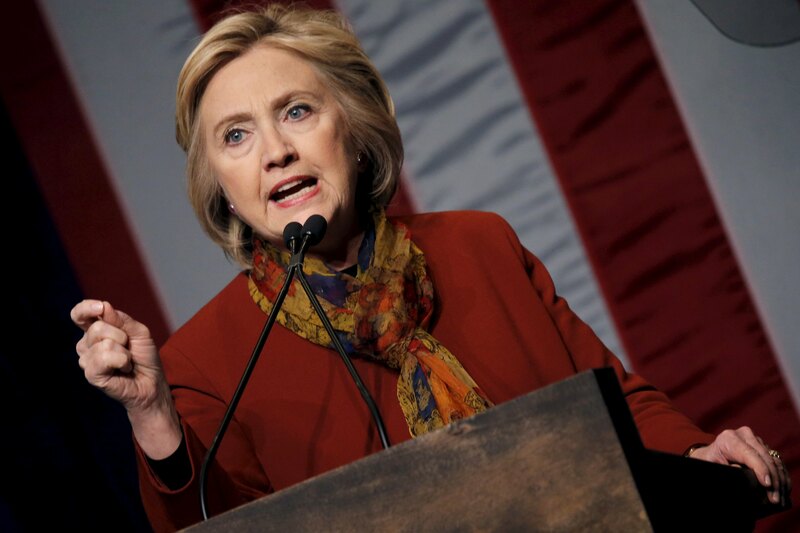 In a speech in Harlem Tuesday, Hillary Clinton suggested there was an element of racism in Republicans' insistence that President Obama should allow the next president to fill the Supreme Court vacancy, instead of making the nomination himself. Republicans are treating Mr. Obama as if "he's not the real president," Clinton said, and she accused them of talking in "coded racial language about takers and losers. They demonize President Obama and encourage the ugliest impulses of the paranoid fringe." This kind of bigotry, she said, has no place in our politics or our country. Her address also outlined how she would tackle systemic racism in America and focused in part on education. She proposed a new, $2 billion plan to end the "school-to-prison" pipeline that disproportionately affects African American children. "We've seen a significant increase in police involvement in school discipline, especially in schools with majority black students," Clinton said, speaking at the Schomburg Center for Research in Black Culture in New York. "A classroom should be a safe place for our children." She added: "We shouldn't even have to say that, I don't think." Clinton's new plan would put teams of social workers and other specialists in schools with high rates of suspensions and student arrests to reform disciplinary protocol, in favor of in-school intervention over police action. "We want districts to know if they do the right thing, we'll have their backs," Clinton said. Schools who "refuse to reform," she said, will face intervention from the Department of Education. "This is not just an education issue," she said. "This is a civil rights issue and we cannot ignore it any longer." Clinton's proposal is part of a sweeping agenda to "break down barriers" facing African Americans. Last week at a campaign stop in South Carolina, she unveiled a $125 billion economic revitalization plan that would provide support for youth jobs programs, minority-owned small businesses and programs that help those who have served time in prison reintegrate into society. Is there trouble up ahead for Hillary Clinton in NV and SC? As she and her rival, Vermont Sen. Bernie Sanders, vie for minority support, Clinton has cast herself as the candidate committed to fighting against injustice in all parts of American life. In her speech, Clinton also touched on the student debt crisis, the need for criminal justice reform and better training for police departments. "We aren't a single-issue country," she said. "We face a complex set of economic, social and political challenges. They are intersectional, they are reinforcing and we've got to take them all on." Clinton said she believes that race "still plays a significant role in who gets ahead in America" and that any candidate seeking voters' support must "grapple" with that fact. Earlier Tuesday, Clinton met with a group of representatives from nine civil rights organizations, including the National Urban League, the NAACP and the National Action Network to discuss a variety of issues, including voting rights and unemployment. In addition to meeting with the group's' top officials, Clinton also met with "emerging leaders" of each organization. Clinton will campaign in Chicago alongside Geneva Reed-Veal, the mother of Sandra Bland, on Wednesday.